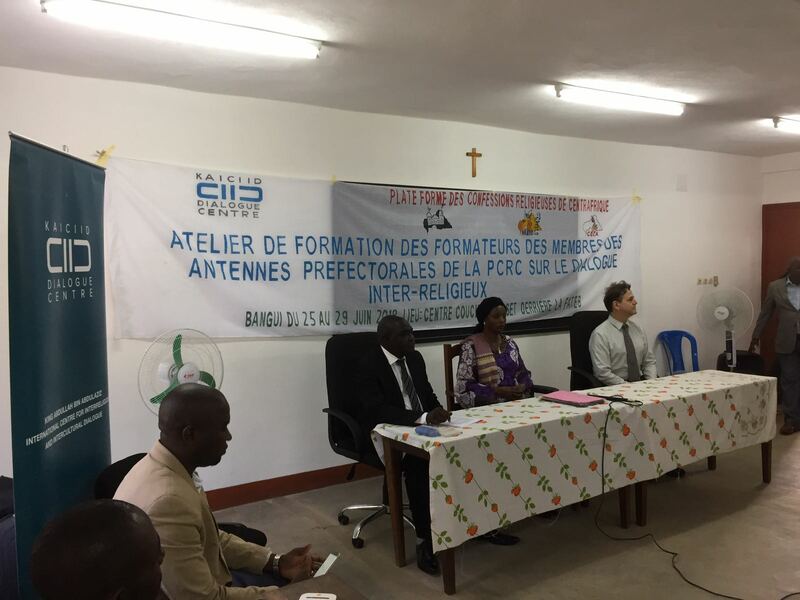 The International Dialogue Centre (KAICIID) has expanded its support to the Central African Republic Interfaith Platform by assisting with the establishment of 16 local offices covering every prefecture in the country. With an initial focus on half of those offices, KAICIID’s Senior Adviser Patrice Brodeur trained 26 Catholic, Protestant and Muslim religious leaders, who gathered in Bangui from 25-29 June 2018, and who will also receive financial support to cover their operational costs for the next 12 months. The eight cities, Alindao, Bambari, Bangasou, Bangui, Berberati, Kaga-Bandoro, Mbaiki, and N’dele were selected for the first training, and a second training for the rest of the regions will be conducted in 2019. After the trainings, the religious leaders will replicate countrywide the Bangui-based secretariat’s Interfaith Platform structure - consisting of three members, each one representing a different religious denomination. The central platform’s leaders are Reverend Guerekoyame Gbngou, president of the evangelic community, Imam Kobine Layama, president of the Islamic community, and Monsignor Dieudonne Nzapalainga, the Archbishop of Bangui. During the training, participants not only learned about IRD tools that can be applied in their communities, but also had the opportunity to meet and interact with other religious leaders, exchanging knowledge and experiences. The training was based on the KAICIID CAR Intercommunal Dialogue Facilitation Manual, developed in 2017 and further updated to respond to the country’s needs. “I greatly appreciate the participants’ efforts to travel from their localities to Bangui to participate in this training. Whoever hears their testimonials is left speechless in admiration. The kind of work they are doing is incredibly brave and awe inspiring”, Agustin Nuñez, Programe Manager for CAR said. “The methodology followed by KAICIID and its established interreligious platform is remarkable because they invited people and touched problems that affect the entire country, from the capital to the smallest township. It is a completely different approach to others that support mainly the vision of a single group. Here I have seen participants from different confessions, religions and ethnicities. Please, keep investing your time to replicate this kind of trainings,” one participant said. Upcoming activities during the remainder of the year in the country include training and logistical support to local peace committees, in partnership with the CAR government, and a training for journalists and other key messengers on conflict sensitive journalism, with a focus on interreligious and interethnic conflict. Additionally, as part of the partnership with Finn Church Aid and the Network for Religious and Traditional Peacemakers, which has so far focused on intra-Muslim dialogue, trainings will be offered to the Christian community in order to prepare both faith communities for interreligious dialogue, with a focus on tackling harmful rumours which put at risk ongoing peacebuilding efforts in CAR. Finally KAICIID in partnership with the OIC and the Network for Religious and Traditional Peacemakers will support the organization of the General Assembly of the Central African Muslim Committee to further unity within that religious community. In the Central African Republic, the Centre supports an existing interreligious dialogue platform that contributes to the reduction of intercommunal tensions and the establishment of lasting peace. KAICIID has also been training religious leaders and civil society members on interreligious dialogue for peace and reconciliation. The Centre is also following up on the implementation of the Vienna Action Plan to promote interreligious dialogue, adopted in 2016 after three inter-and intra-religious meetings convened by KAICIID, and supported by representatives from the Muslim and Christian communities as well as various governments. The Centre is also entering a partnership with the Ministry of Humanitarian Action and National Reconciliation to support the operationalization of Local Peace Committees through the entire territory of CAR.